Squam Brewing: The finest ales in Holderness, NH and Squam Lake. 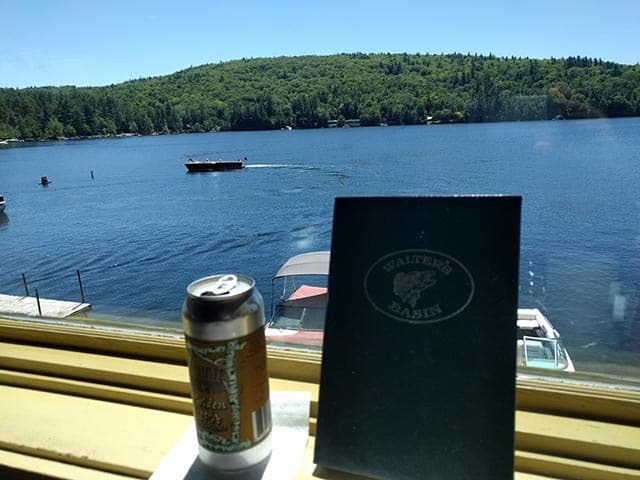 Squam Brewing can be found just northwest of Squam Lake, in a quiet part of Holderness, NH, about 7 miles away from Walter's Basin. John Glidden, the owner of Squam Brewing, started the nanobrewery 8 years ago, leaving a more traditional job for the life of a brewer. And after speaking with him on the brewery tour, I hold no doubt that he does not regret that decision. Squam Brewing Golden IPA and a view of Little Squam at Walter's Basin (restaurant). Squam Brewing claims to be, “Brewing the best beer in the Lakes Region since 2010!” They make a strong case. The Mountain View Red was delicious, and the Rattlesnake Rye-P.A. and Covered Bridge Pale Ale followed up nicely. I’m holding out for his signature IPA (currently conditioning) and the No Wake Wheat. If you’re into rural and rustic, Squam Brewing is your place. The brewery itself is in a barn that is partly built into the side of a hill. The smell and sight of farmland extends across the property, really driving home the “nano” in this one-man nanobrewery. I did. Tours are by appointment only, I set one up a recent trip to Lake Winnipesaukee. John was prompt and responsive to arranging the tour, and at a cost of $10, it was well worth it. We discussed his brewing process as he showed us his barrels (3), grain storage, bottling, and storage. All in all, well worth 30 minutes on an otherwise lazy Saturday. Some interesting things he pointed out was his help in securing momentum for the NH state legislature to adopt more startup friendly rules for opening and operating a nanobrewery. And, as the first of it’s kind, and being license holder #1, he is technically the oldest “Nanobrewery” in the nation. That’s really in name if we are all being honest. Remember, not all New Hampshire breweries offer a tour. So take one, it’s a great experience. What types of beer does Squam Brewing brew? A fair share. He seems to rotate over 12 beers seasonally. From stouts (Imperial Loon Stout and Halcyon Steamer Stout) to ales (Asquam Amber Ale and Covered Bridge Pale Ale), Squam Brewing crafts something for everyone. They even offer a Barleywine (The Camp), something he is reluctant to transition from bottles to cans - a trend he is adopting due to customer demand. Lost in the bottle to can transition will be his fantastic labeling. The bottle artwork really captures the outdoor spirit of the Lakes Region, from ice fishing (Bobhouse Bitter) to the skiing (Winter Wheat). Luckily for everyone, he sells ceramic coasters that will put these fine paintings on your coffee table/bar all year long. Pint glasses are for sale as well. The Golden IPA (presumably). Why presumably? John claimed that his IPA is the flagship and that was the only one he mentioned. I could be wrong. Other Squam Brewing beer details I should know? No mug club. No flights. No growlers. No wine, mead, or other liquor. Why? Not a brewpub. Does Squam Brewing offer food? No. At this time, Squam Brewing is just a nanobrewery, not a brewpub. Once again, no. No trivia or music. This is just a one man operation that is strictly about brewing good beer. Where can I buy Squam Brewing beer in stores? Squam Brewing beers are sprinkled around the Lakes Region: Holderness, Campton, Meredith, Center Harbor and more. See [our beers] on his website. Plus, he sells them direct if you take the tour (recommended). Also, he recently started attending the Concord Farmer’s Market on Saturday mornings to drive additional sales. 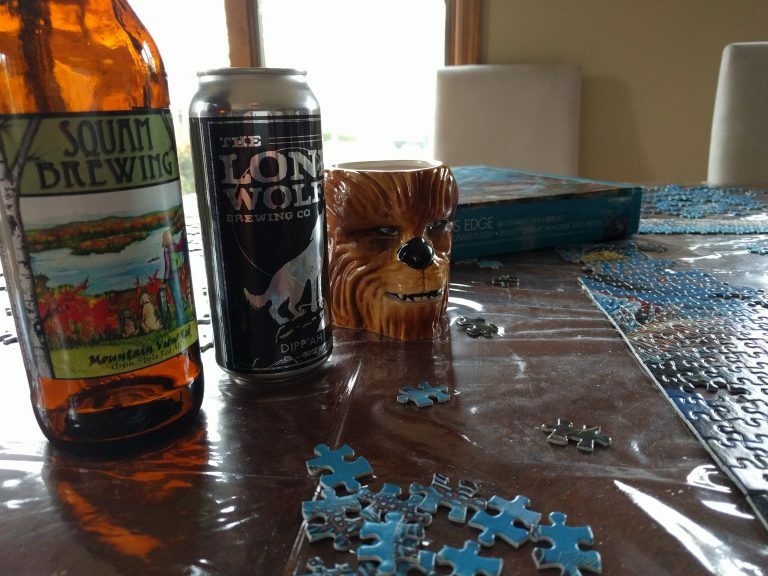 Chewbacca and I made the Puzzle Run in less than 12 beers! He brews custom batches of beer. How awesome would it be to serve your own custom batch of beer at your Super Bowl Party? Or, take it to college football tailgates? John Glidden proves that a true nanobrewery can make money and be profitable. This is what the craft beer movement is and should be about: one person making something truly fantastic and sharing it with others. An appreciation for craft beer isn’t exclusive to Portland, Brooklyn, and Allston hipsters, it’s about enjoying beer made by hyperlocal artisans. Let’s get back to custom batches for a second … I definitely see a Pants and Fizz Tripel in the near future.